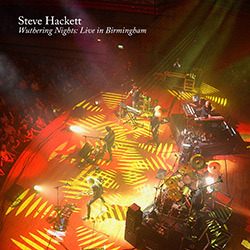 Steve Hackett's latest concert film is called Wuthering Nights: Live In Birmingham. It is available in Europe on Blu-ray or as a 2CD / 2 DVD set. A digital version of the live album is available, too. Wuthering Nights was recorded in Birmingham's Symphony Hall in spring 2017. All forms of this release came out on January 26, 2018. North America only gets a Blu-ray/2CD set. This is because of market demands, which means that North America is the only place to get that kind of set. The concert film had to be spread across two DVDs because of its length, which is not the best idea. DVD1 contains the Hackett set while DVD2 has Genesis tracks and the encores. Concert film aficionados should choose the Blu-ray, even though it does not have the CDs. The distribution of the songs onto the audio CDs is another compromise: The first song of the second set (the Genesis tracks) is on disc 1 because they needed space on disc 2 for the encores. This is negligible in these digital days where you can listen to all the tracks in one go. The package design follows that of previous concert films, but the photos that were inserted seem a bit random. The cover artwork could have been more inspiring – imagine, for example, the artwork for Steve's latest solo album and for Wind & Wuthering. Steve has divided his set into two halves. He plays solo tracks in the first half. These include three tracks from his current album The Night Siren as well as two surprises, Rise Again from Darktown and Serpentine Song from To Watch The Storms. Amanda Lehmann and John Hackett appear as guest musicians, which means that Shadow Of The Hierophant has the vocals – this only happens when Amanda is there. We would like to also mention One For The Vine that premiered in his set during that tour, and Inside And Out, a hidden gem from Genesis' Spot The Pigeon EP. Slogans / Los Endos is a brilliant choice for a closing piece, with Nad Sylvan's final line “there's an angel standing in the sun…” sends shivers down your spine. If you attended the shows in spring 2017 this concert film will be a wonderful trip back to the concert. Many tracks have been captured beautifully. Some songs we have heard often seem a bit blunted and you may feel occasionally that you have seen this or that done better on an earlier Blu-ray/DVD. The sound is very authentic, though not quite as crisp as on previous releases. The Blu-ray sound is stronger and more precise than on the CDs, with only the drums perhaps a tad too low in the mix. The video material is good without any highlights. There is some noise in the images in some places, but all in all it is very enjoyable. The camera focuses a lot on Steve's guitar play, but it also has fine long shots and interesting views from the side of the stage. The audience appear rather tame (some people excepted). They still give them standing ovations. The Symphony Hall in Birmingham is a very posh venue for classical concerts; at the beginning of the show Steve jokingly announces that they are going to ruin the venue with their rock music. The arena of the venue is rather small but there are several balconies, so it is a worthy location for a concert film! It has become something of a tradition that we get a kind of report that leads us through the backstage area of the Birmingham Symphony Hall. There are soundbites from the band as well as from John Hackett, Amanda Lehmann and Steve's wife Jo Hackett. Steve talks not only about the tour and the Birmingham show, but also about refugees, who influenced at least two songs of Steve's current studio album, and on music in general. Official music videos for Fifty Miles From The North Pole, Behind The Smoke and West To East round off the bonus material. Wuthering Nights: Live In Birmingham is a fine testimony of Steve's recent tour. It is a good representation of the concerts he has played in recent years and adds to the previous releases Live In Liverpool: The Total Experience, Genesis Revisited: Live At The Royal Albert Hall and Genesis Revisited: Live At Hammersmith. Perhaps this kind of release wears out a bit and you may feel that previous releases are better in some places. But that is a luxury problem, and we all hope that we are going to see a concert film of Steve's 2018 orchestral tour, too.